Since it’s Friday I thought we would keep it light and rollback the clock several weeks and revisit a conversation we had with Doug Kessler, Co-Founder and Creative Director at Velocity Partners. Doug & the folks at Velocity are quickly becoming Slideshare rock stars with their entertaining, fun and educational decks and this one is right up there with their best stuff. 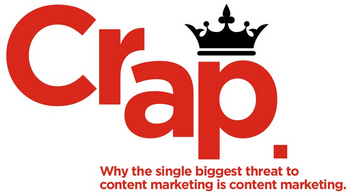 It’s called ‘CRAP THE SINGLE BIGGEST THREAT TO B2B CONTENT MARKETING’ and I think you will enjoy it. So grab your bevvie of choice and listen to our short conversation with Doug Kessler on this ‘A Slice A Day’ REWIND…..